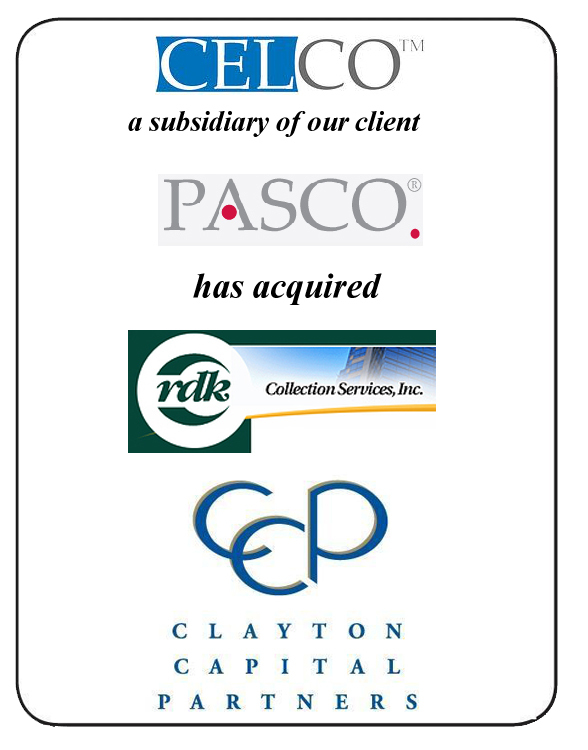 Clayton Capital Partners Announces that CELCO a subsidiary of its client PASCO has acquired RDK Collection Services, Inc.
Clayton Capital Partners is pleased to announce the purchase of RDK Collection Services, Inc. by CELCO, a subsidiary of its client PASCO. RDK Collection Services, Inc. (www.rdkcollections.com) based in Troy, MI, provides adjustment and collection services. CELCO (www.celco-group.com) based in Hudson, OH, provides debt recovery solutions that focus on maximizing return while providing a professional quality customer experience. PASCO (www.pasco-group.com) based in Hudson, OH, is a diversified holding company with significant experience in business process services. Clayton Capital Partners (CCP) is one of the nation’s top independent investment banking firms providing M&A advisory services to a diversified client base of middle-market companies. Clients have come to rely on our expertise, our commitment to client services and our innovative ability to create value. The principals at Clayton Capital Partners focus on satisfying the complex needs and objectives of our clients through our core business practice of M&A. Together, our professionals have acted as financial advisors in more than 200 advisory transactions. If you would like more information about this transaction or Clayton Capital Partners, please contact Kevin Short, Managing Partner at (314)725-9939 x 525 or via email at kshort@claytoncapitalpartners.com.